Our vision is to gain life-long friendships. 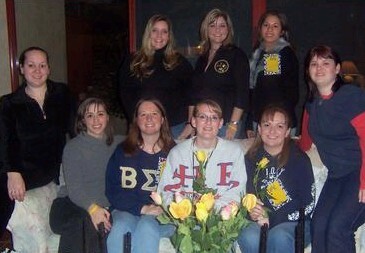 Some of our mothers have been members of Beta Sigma for over 30 years! We look forward to moving through the many stages of our lives together and sharing all the wonderful expierences that come our way. We also want to be able to raise money for the Beta Sigma Phi charities. Last year we were able to donate $2,000.00 to four organizations we support. What a great way to give back to the community while making life long friendships with your Beta Sigma Phi sisters! Our chapter is fairly new. We were established in December of 2001. The chapter was founded by April Wilder, daughter of Arlene Coriell who has also been involved in the organization over 30 years.